Lake Geir is a lake in the western Rift. 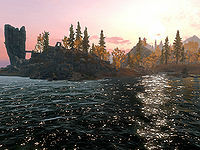 Ivarstead is built on its western shores. The lake is fed by Treva River and is drained by Darkwater River. It is named after Archmage Geirmund, a First Era wizard who died nearby in a duel with Sigdis Gauldurson, the son of Archmage Gauldur. A tomb for the Archmage can still be found on the largest island in the lake.